Step inside Cascade Villa for the first time and experience a “freeze frame” moment you won’t soon forget. Turn the door handle and “BOOM,” you’re engulfed in Cascade’s wall-to-wall vision of color. Kick off your sandals and inhale an amazing sensory sensation. 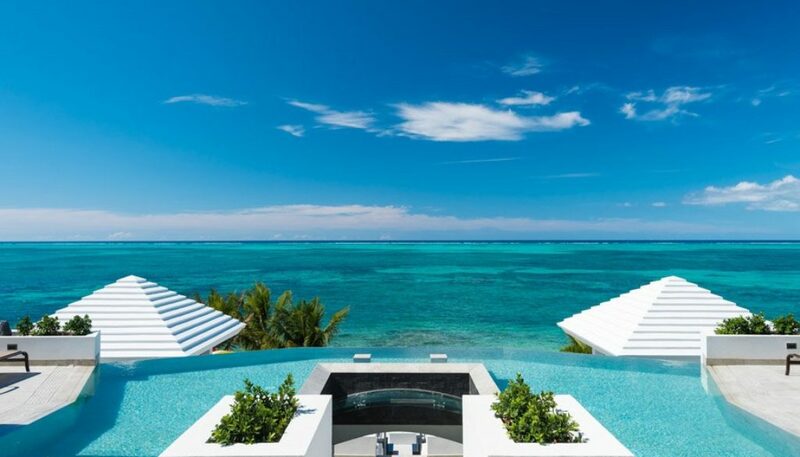 Cascade’s 180-degree Caribbean Sea view is an architectural marvel. Imagine reaching out and almost touching the third largest coral reef in the world. You’ve been in Cascade Villa for less than a minute, and you’re already head-over-heels in love. 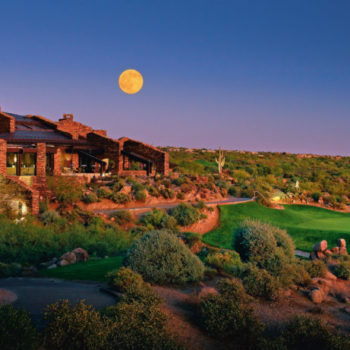 Cascade Architect Ron Shaw doesn’t believe in saving the best for last in this 9,200-square-foot villa layout. 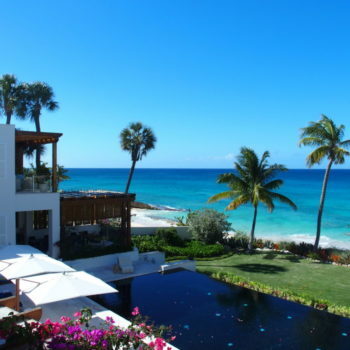 Shaw makes a handsome living designing Turks and Caicos dream homes with ocean views that are as stirring as they are picturesque. 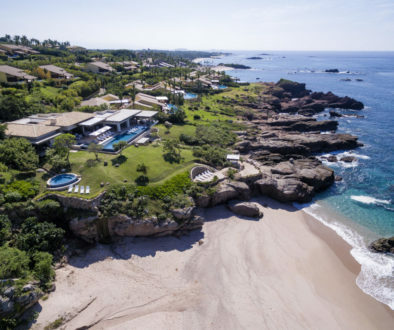 After spending your first Cascade Villa night falling asleep to the sounds of ocean waves, you awaken energized, and contemplate experiencing this island that you’ve heard so much about. 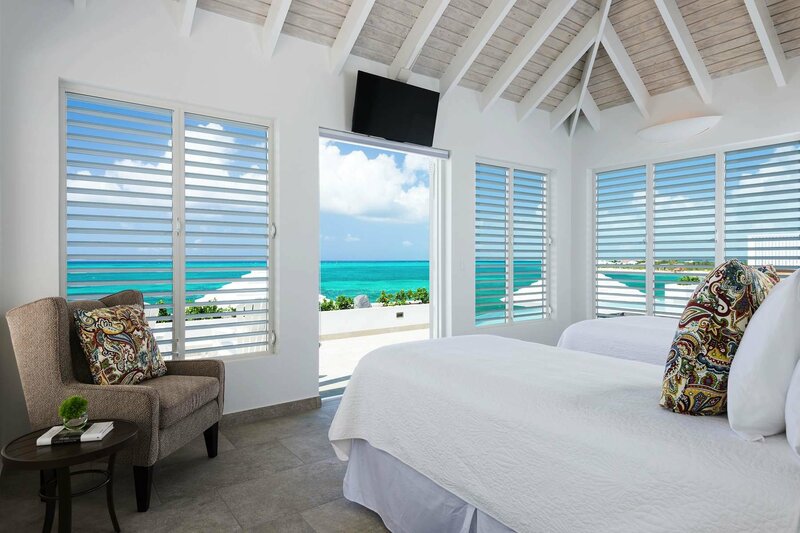 Since each of the Cascade’s six bedrooms features its own private terrace, you pour yourself a cup of coffee and drink in a quiet moment while gazing out at the Caribbean Sea. Isn’t this the best wakeup call ever? 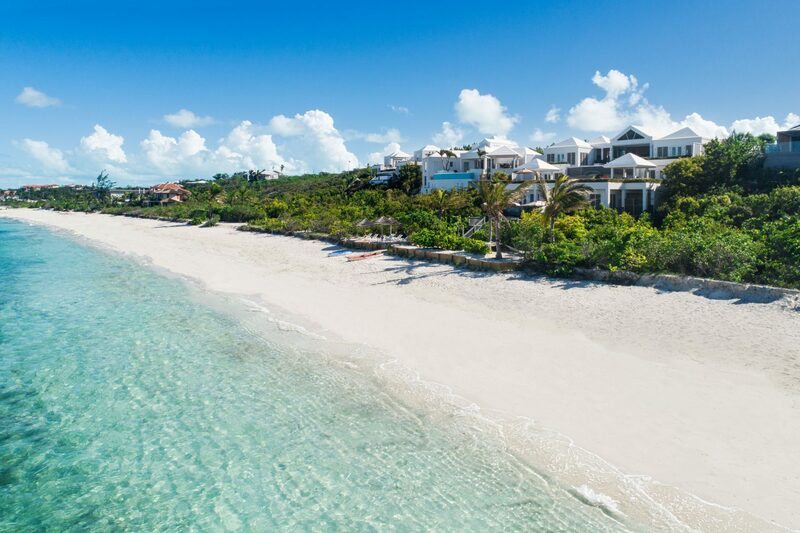 In Turks and Caicos, everyone has heard of amazing Grace Bay Beach. 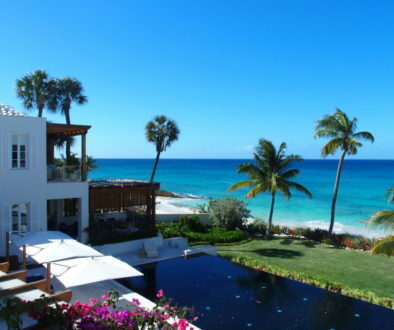 Cascade Villa is perched on secluded Babalua Beach. 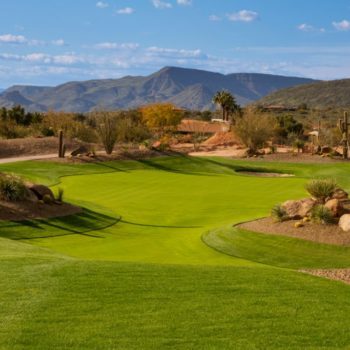 On Cascade’s mile long swath of white sand, you definitely have options. Venture right and explore Smith’s Reef and Turtle Cove Marina. 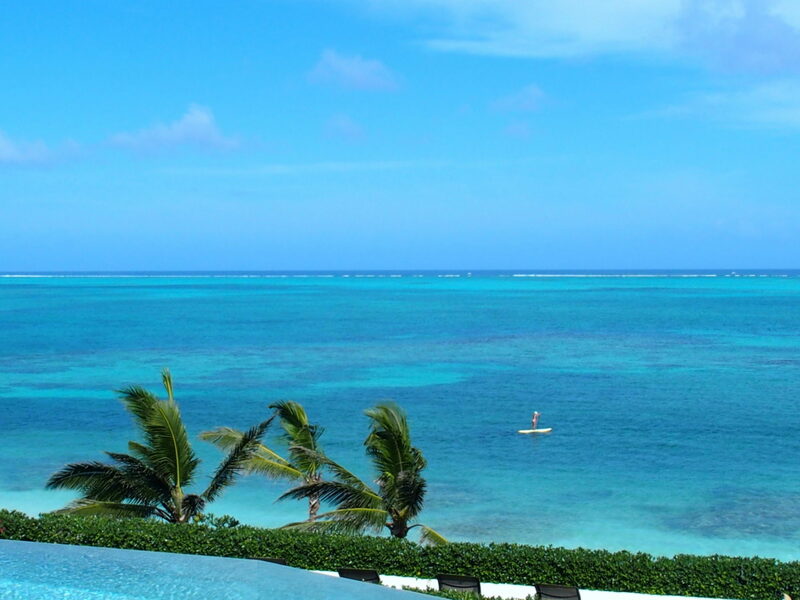 Turn left and you’ll find Blue Mountain, Providenciales’ highest point. Continue a bit further and check out the Conch Shack, the island’s legendary beach bar and restaurant. In front of you, enjoy spectacular snorkeling, paddleboarding, kayaking, and scuba. There is also the tranquil option of curling up with a book and basking in the sun. 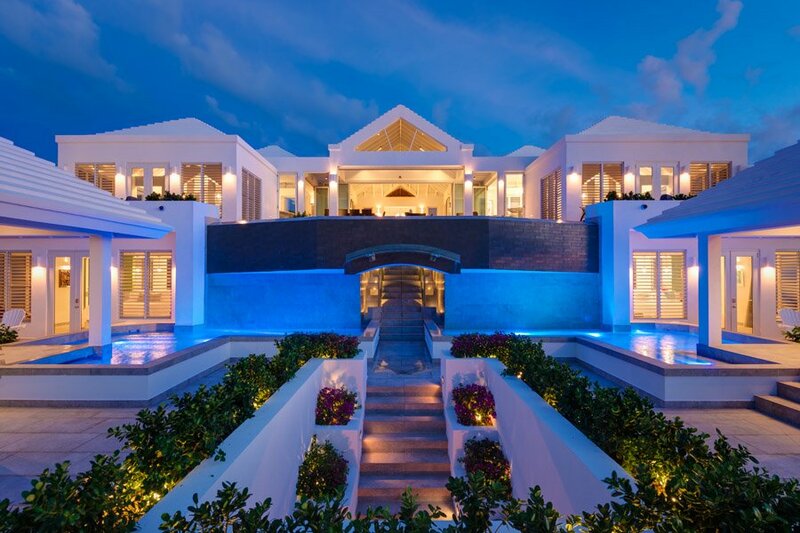 Like a well thought out novel, Cascade Villa allows you to write your own chapter. Ever since you absorbed Cascade’s first impression view, you’ve thought about an intimate meal dining in. After a dinner featuring Providenciales’ freshest seafood, you move the party down one level to revel in the ambiance of the Cascade’s one-of-a-kind fire pit. After a dinner of great conversation, great wine, and of course, great views, it’s time to savor an evening under the stars while enjoying Providenciales’ perfect weather. 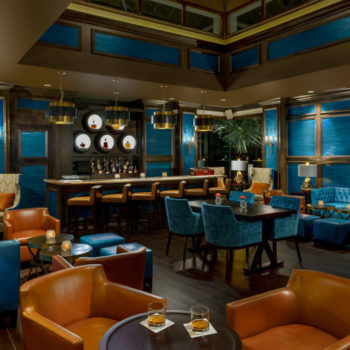 The fire pit, a favorite cocktail, and the gentle tradewinds make this a night to remember. Evenings at the Cascade are spectacular. 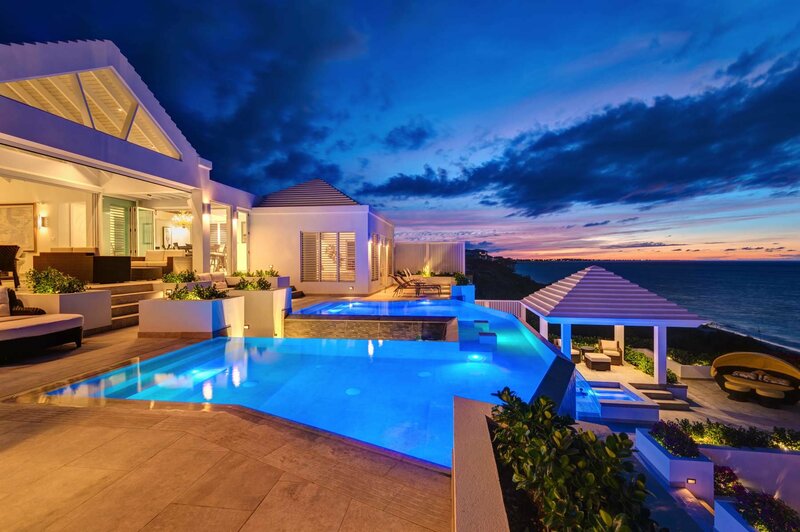 The sounds of crashing ocean waves, cascading pool water, and the visual array of recessed lighting blend in perfect harmony with the Caribbean sky. Stargazing at Cascade Villa is like experiencing your own private fire dance. 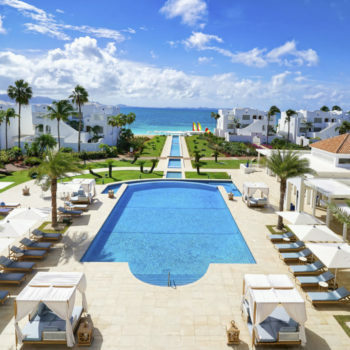 Turks and Caicos is a paradise for beach walking, five-star restaurants, championship golf, horseback riding, and witnessing the most radiant turquoise water in the Caribbean. Vacationers have the delicious decision of exploring all the island has to offer, or simply decompressing and doing nothing at all. 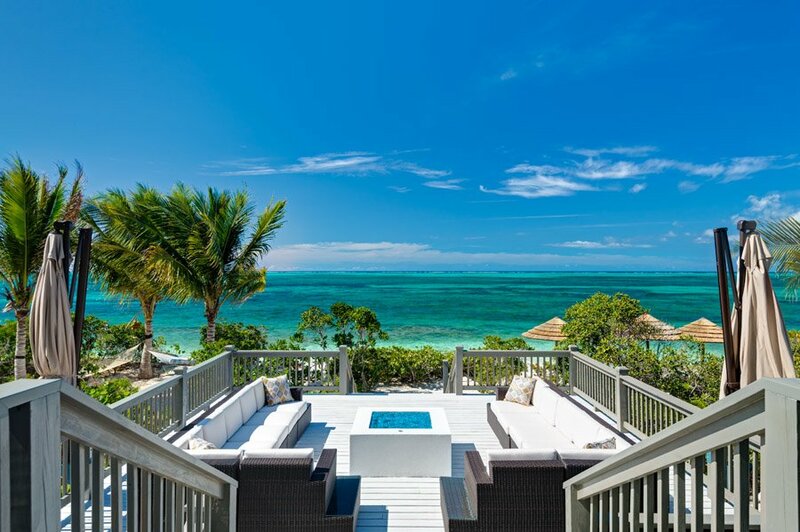 As you step back through the same entryway from which this Turks and Caicos dream vacation began, you glance one more time at Cascade Villa’s awesome panoramic view of the Caribbean Sea. 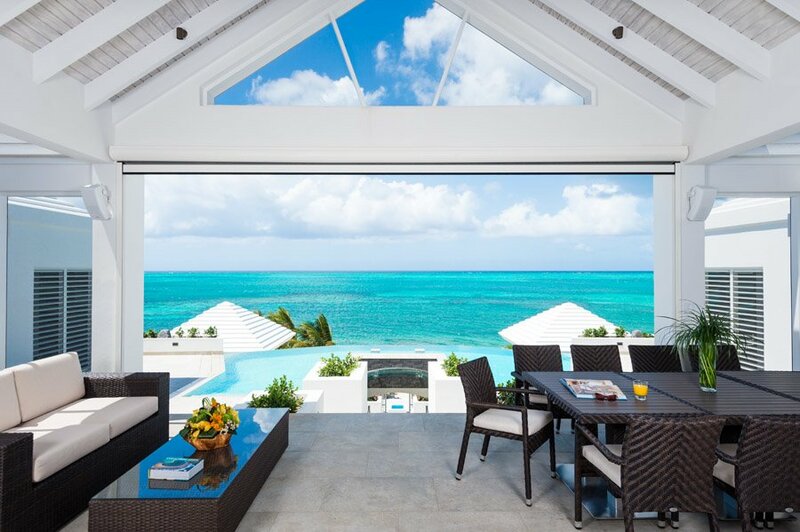 Before driving off to Providenciales’ convenient airport just 15 minutes away, you tip your visor to Architect Shaw. Thanks for saving the best for first, for breakfast, for beach, for evening, and for a vacation memory that will last a lifetime.